This package was approved by moderator gep13 on 7/16/2018. Never worry about spam emails ever again! 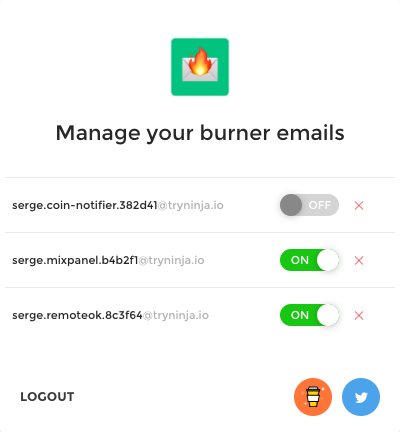 Burner Emails is a tool to generate a random email address for every form that you're submitting online, that will forward all emails to your personal email address. This hides your true identity from the sender and protects you from spam. If later on you don't want to receive emails from them anymore, you can disable or delete your address and be done with them! It's like your very own unsubscribe button that actually works on every email ever sent. Copyright © Burner Mail. All rights reserved. This discussion is only about Burner Emails for Chrome and the Burner Emails for Chrome package. If you have feedback for Chocolatey, please contact the google group. Tell us what you love about the package or Burner Emails for Chrome, or tell us what needs improvement. Deployed from e27d7a207f. You are on web.3. UTC time is currently 25 Apr 2019 16:59:16 +00:00.